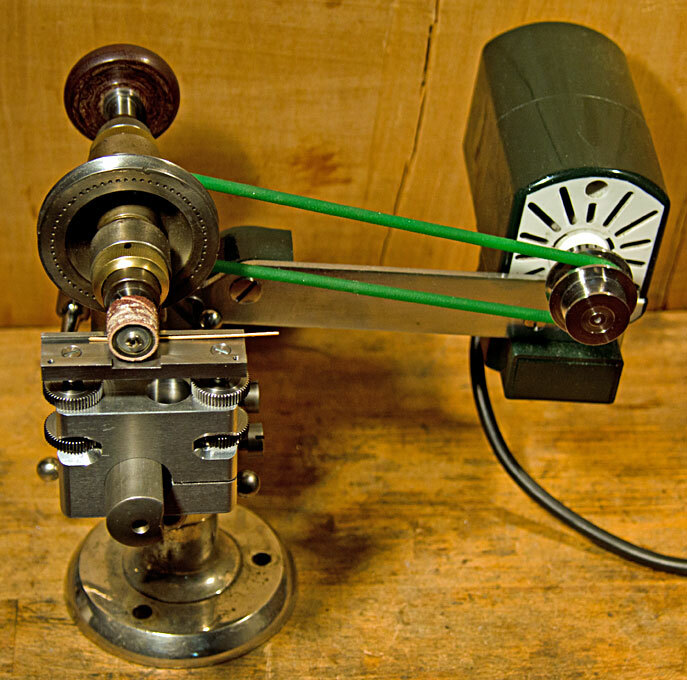 Grinding certainly is an operation that does not contribute to the longevity of a lathe. I therefore avoided this as far as possible. On the other hand, I always missed a maschine with which one can grind sub-millimetre thick materials and small, short workpieces. In addition my small PROXXON table saw, notwithstanding some improvements, is not really suitable for sawing on parts that small. 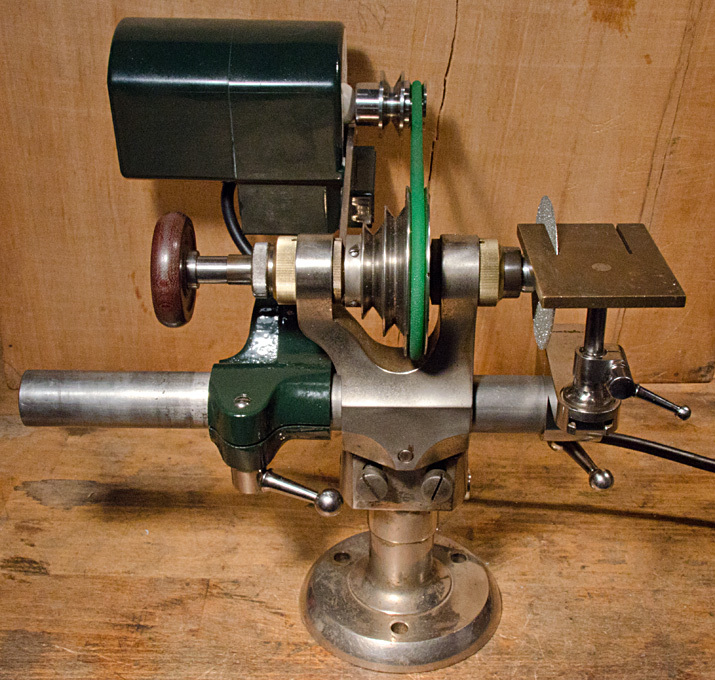 A watchmakers lathe is a good basis for the development of a suitable machine. 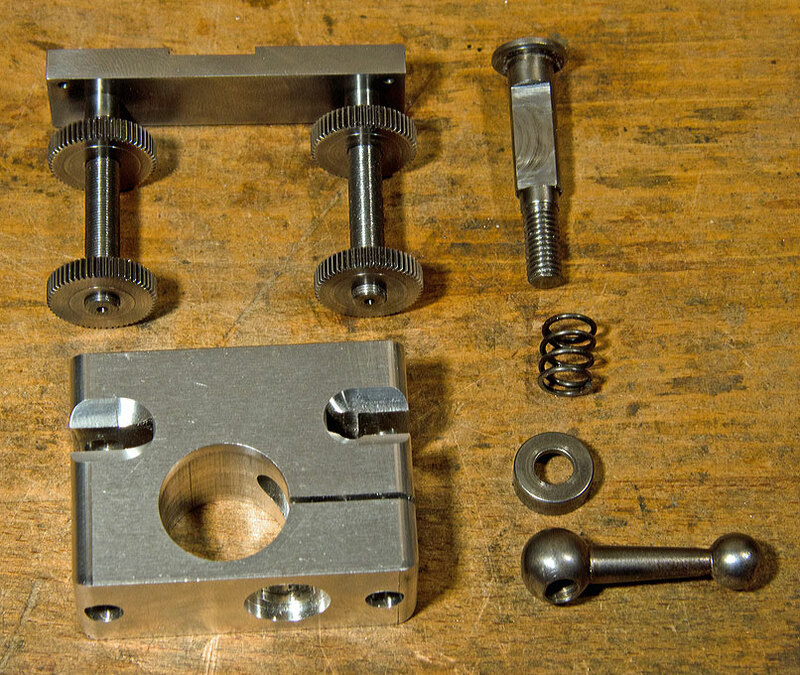 A short while ago, I was able to obtain a ball-bearing headstock at a good price, which will form the heart of the machine. 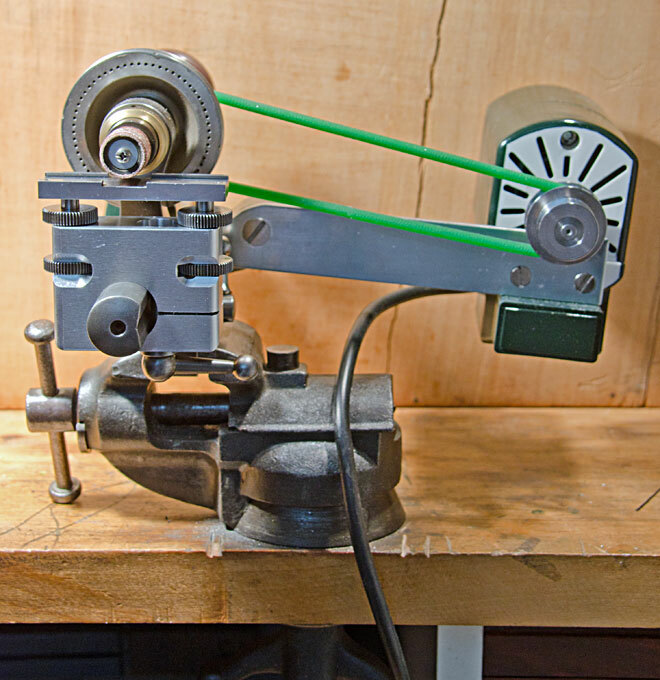 In the past some manufacturers of small bench lathes actually offered grinding and sawing machines on the basis of their headstocks, but this is long ago. 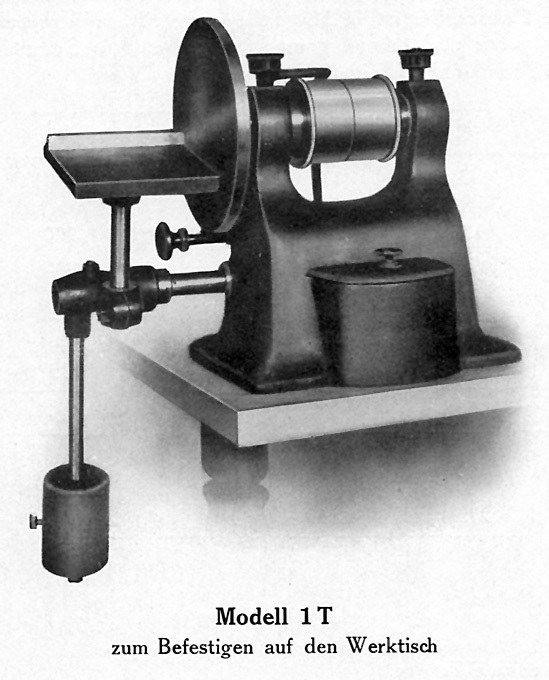 There are, of course, two main types of watchmakers lathes, those with the round, so-called D-bed and those with the prismatic WW-bed. The WW-bed would be more solid and heavier, but the D-bed gives more geometric flexibility for the envisaged attachments. In addition, D-bed parts are easier to come by in Europe than WW-compatible parts. 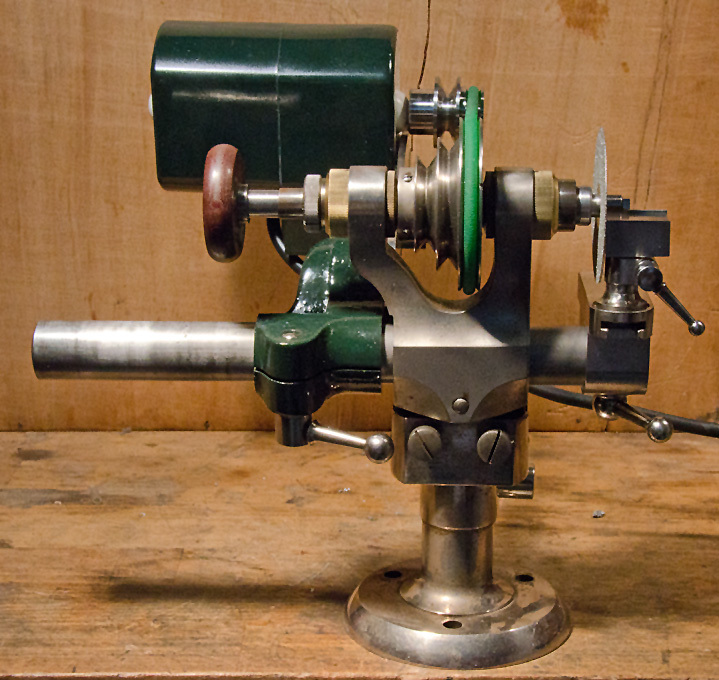 Over the years I had already collected a number of useful parts inter alia with a view to construct such machine. I first made an adjustable motor bracket from a couple of recycled parts. 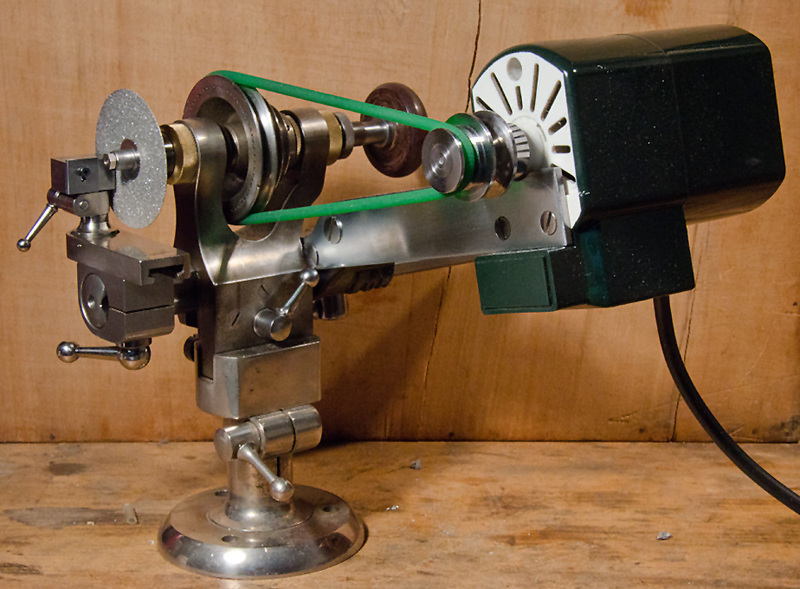 This bracket mounts to the lathe bed, so that motor and grinding machine form a self-contained unit. There are feet to which such lathes can be mounted and that allow their orientation in various direction, which will come handy. 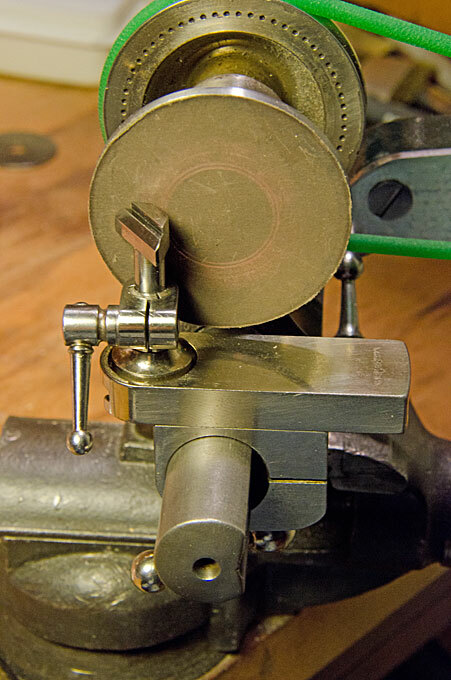 A common practice amoung the watchmakers of old was to hold the lathe in the bench-vice, which is even better, when the vice can be rotated. In this way the workplace is kept free. 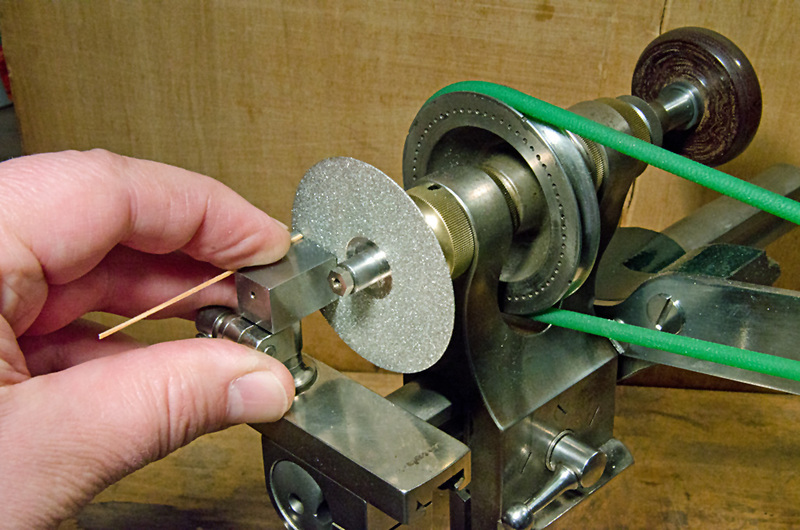 All these attachments are held in the T-rest holder of the lathe, which allows to position e.g. the saw table in a particular height and distance from the grinding disc. 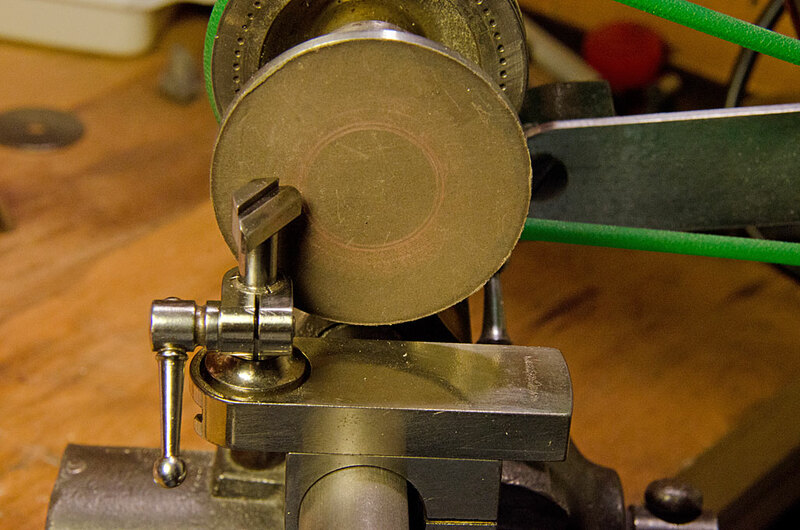 The watchmakers lathes can be equipped with height-adjustable saw-tables that can also be used as a grinding table. Some models of saw tables have an adjustable fence. However, for working on really small parts these saw tables are somewhat big and the ones I have do not have very precise fences. 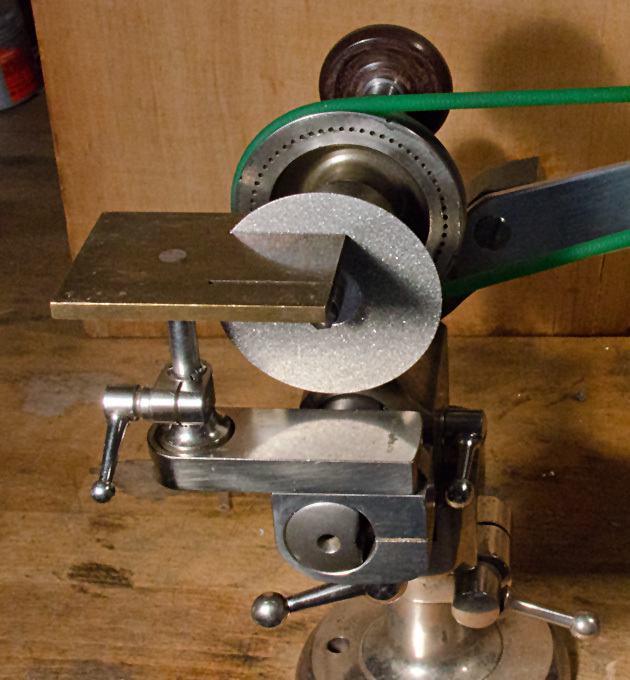 I therefore made a range of micro-grinding tables. In addition there are attachments for slotting and grinding screw-heads, sometimes called ‘utility sets’. These attachments consist of a square body that is bored for the lathe collet shafts. 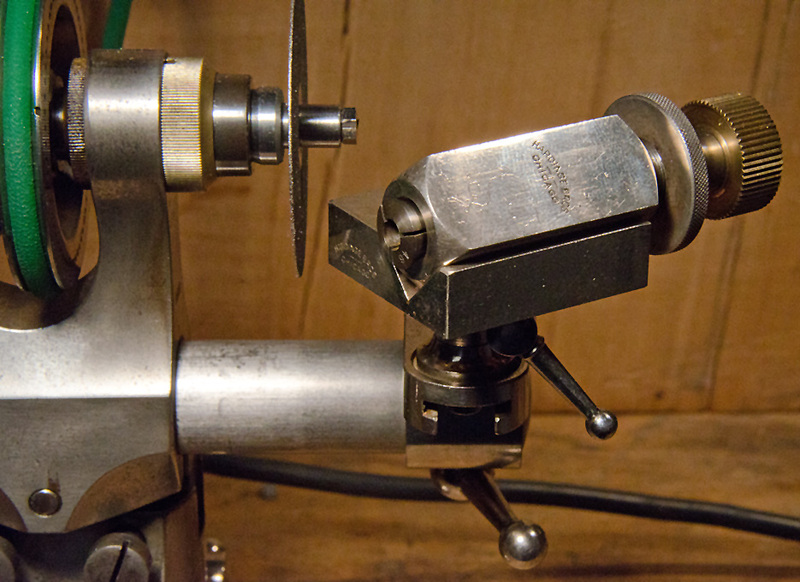 A thumbscrew allows to adjust the feed during grinding. 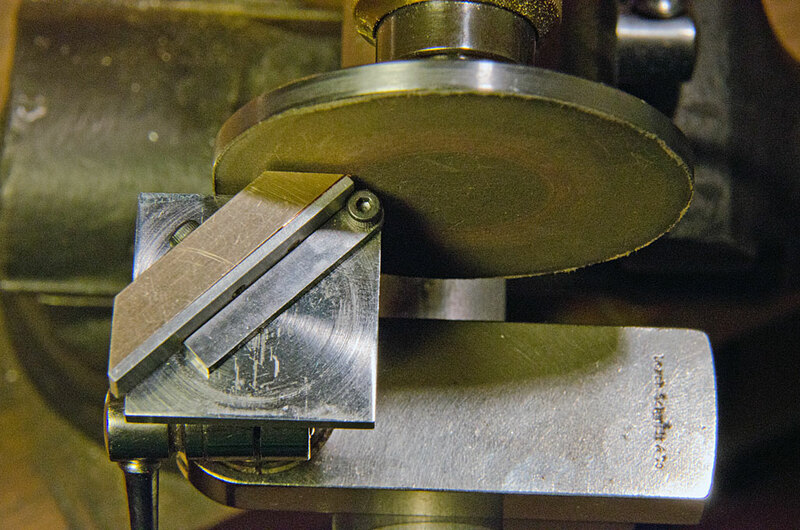 The square body rests in a V-groove of the grinding table. 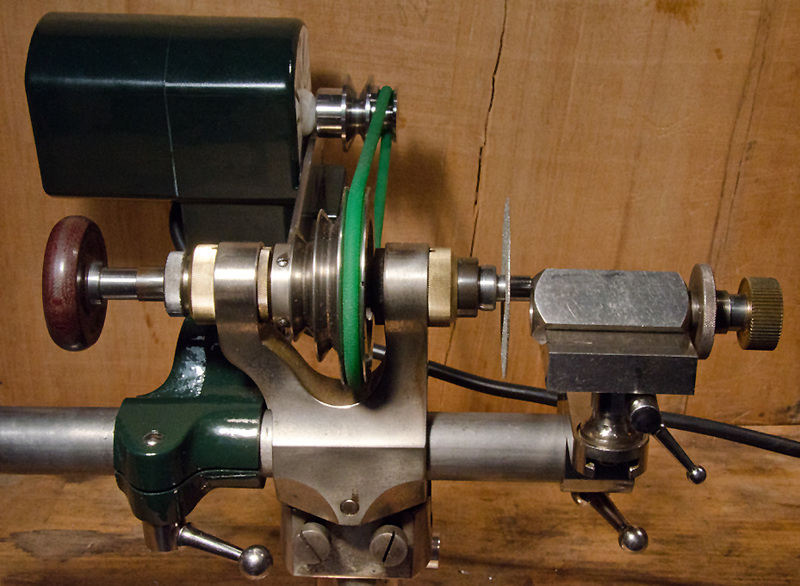 This attachment is useful for grinding squares onto shafts and similar operations. A small table with a surface of 15 mm x 10 mm and a fixed (but heigh-adjustable) 90° fence was made from a small block of steel. Another has a surface of 20 mm x 20 mm and the angle of the fence is adjustable. For grinding mitres onto very small pieces a very small grinding rest with a step milled on one side was made from a piece of 5 mm x 5 mm steel. 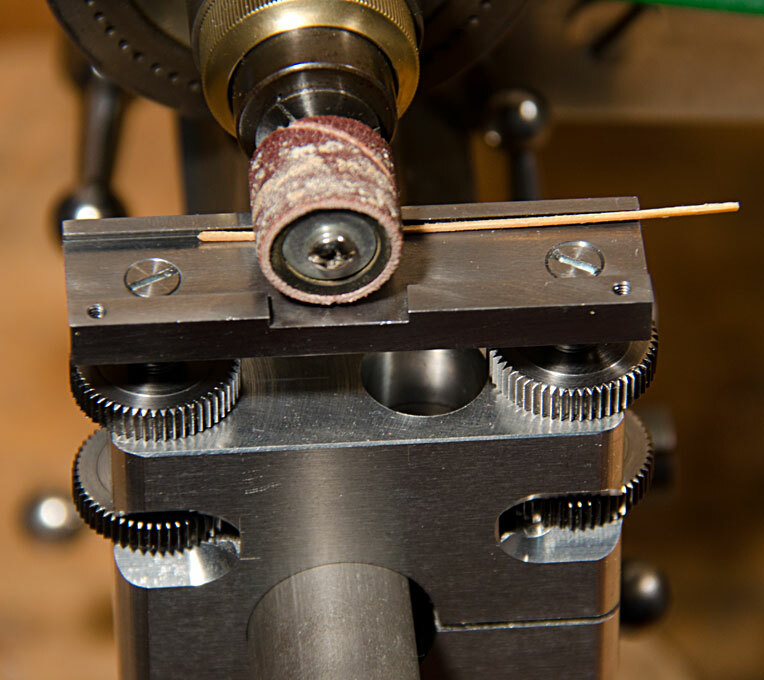 It has opposed 45° bevels on both ends to allow to grind in- and outside mitres with the part resting against the step. 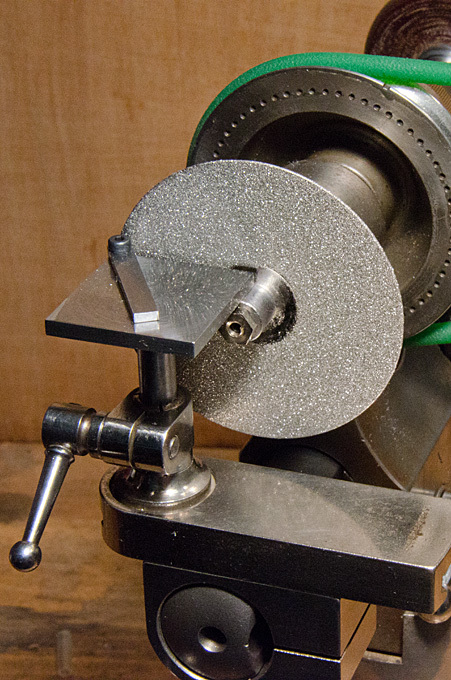 The above grinding rest still does not allow to manipulate extremely small parts, such as wires, with a defined orientation; to overcome this a special holder was made with bevelled ends for use in conjunction with the 20 mm x 20 mm grindind table. The holder works in a way similar to vice. Later I will also make an inclining table that allows to grind composite angles onto parts. Of course, one table may have been sufficient, but I found that fixed angles reduce the tool mounting times and are more solid. Staying with the idea of providing tools for working on really small and delicate parts, I also designed a micro-thickness sander attachment. The brief was that parts with a maximum width of 10 mm and minimal thickness of 0.1 mm should be able to be worked on. The main body was fashioned from a block of aluminium. I prefer actually to use steel for machine parts, but choose aluminium here in order to speed up the machining process. The main body houses two small threaded spindles that allow to raise and lower the sanding table. A variety of zylindrical tools can used, such as expanding mandrels for sanding paper tubes and corundum, rubber-bound, or diamond grinding bits. The attachment could also be used like a planer by employing small milling bits. 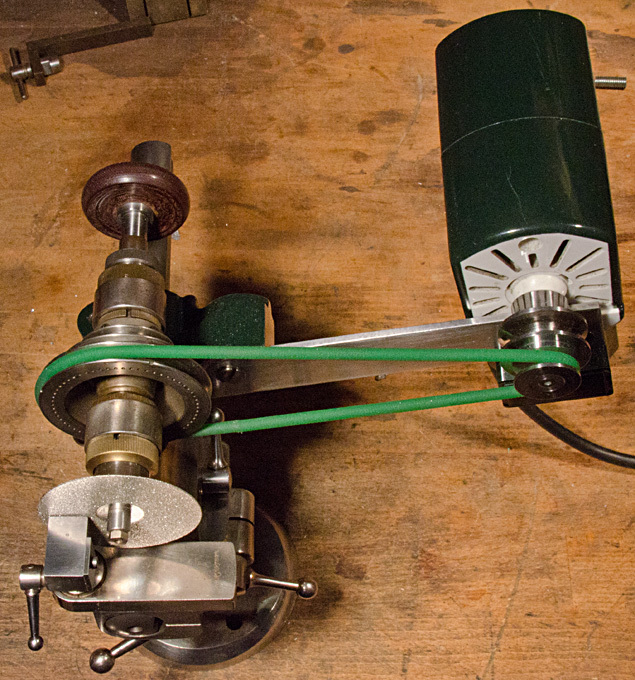 The main body was designed to be clamped to the lathe bed in the same way as the T-rest holders. In my spare-parts box I found a suitable tightening bolt and the associated hardware. The spindles were threaded 6 mm x 0.5 mm on the lathe. This thread provides for a very sensitive height adjustment and was possible, as I had by chance a matching tap for the thumb-screws. The knurling on them was not cut with knurling wheels, but milled in using a 60° cutter and the dividing head in the milling machines. 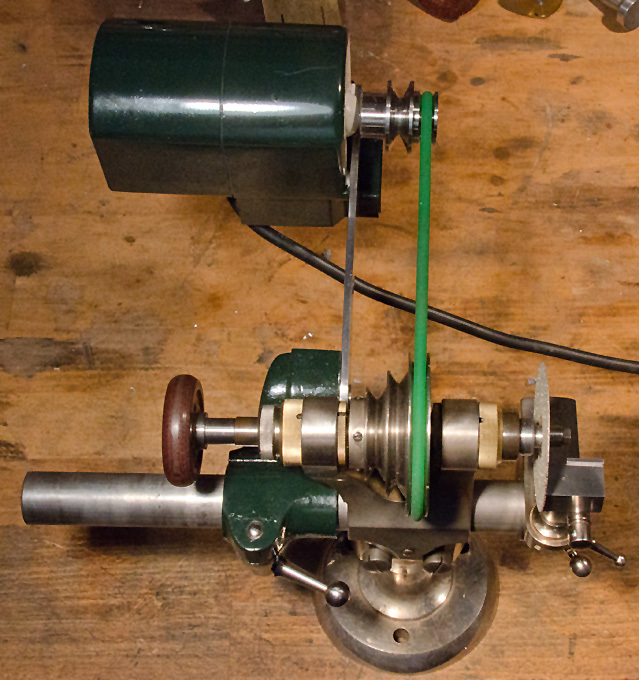 This is kind to the lathe. The sanding table was fashioned from a piece of flat steel for greater wear-resistance. 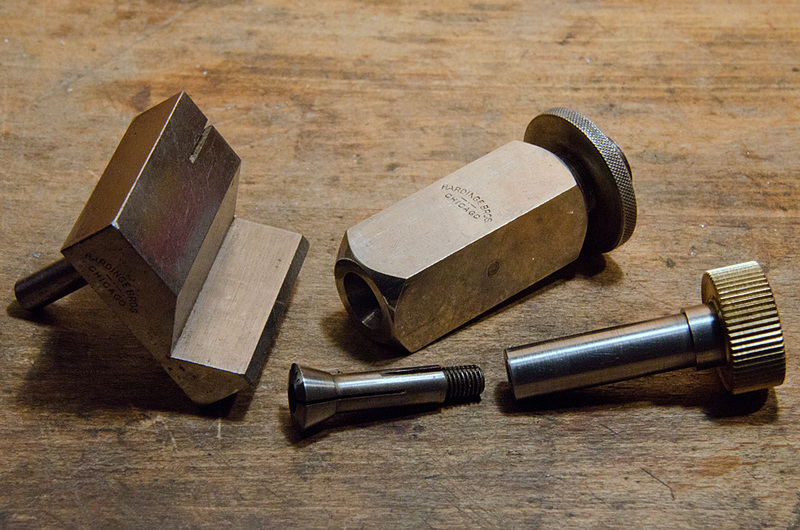 In order to prevent the lateral movement of the parts being sanded, I milled into the surface a schallow channel. 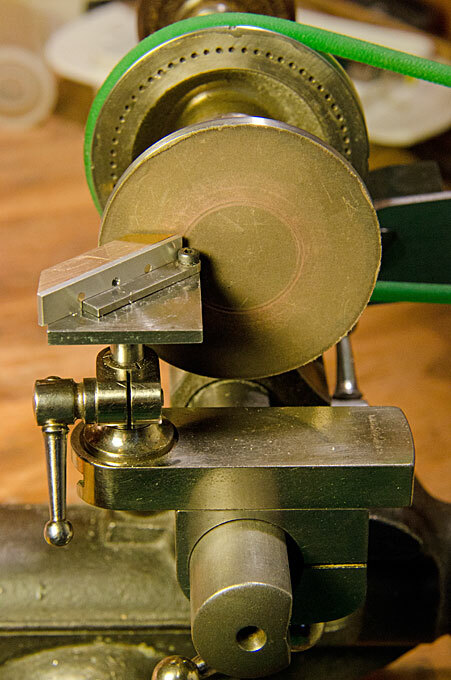 The sides of the channel were undercut using a dove-tail cutter in order to keep the workpieces down on the table. I have provided the table with two M2-threaded holes that will allow to attach a fence or a down-holder. With this fence the thickness sander table can also be used as a micro-router e.g. for shaping longer strips of wood or plastic. Considering the smallness of the parts to be worked and the consequently small amounts of dust I have not foreseen any dust control.